BREA Photos (Portraits by Tom and Lisa Cuchara): Signs for Weddings, etc. Please note that these photographs are not ours, they are from the company's site, but these would make for a great prop for an upcoming wedding or other event! Thank you, Mr and Mrs, lawn signs, chiar signs, signs to hold, make custom photo cards, etc. We specialize in unique, hand crafted wedding, reception and your house, signage of different styles appealing to a variety of brides and any one else who has a home. Welcome to "Our Hobby to Your Home & Wedding" Etsy Shop. We are now taking orders for 2011 Weddings. Get on our "To Do" list soon, before "Wedding Season" is here!!! This shop is a family owned and operated business. Thank you for your support!!! Every sign is handmade by my two daughter's and myself. You won't be disappointed with our quality hand crafted workmanship from start to finish. Our ' Last Name and Welcome' signs make great Christmas Gifts for just about anyone on your List. Order early to ensure that you receive your sign in plenty of time. Let us help make your upcoming wedding or special event a little more personal. If there is anything that you don't see that you are interested in, just send us a message with a picture attached or a description and we will work together to create the perfect sign for you. If you are a Wedding Coordinator, Event Planner, Party Planner, Florist, Photographer, Homemaker or a Bride-to-be, you are sure to find something just perfect for you or the client you are working with. The majority of our wood is recycled, which can sometimes add character to your sign. All of the wood is solid, no plywood. With most pieces of wood you could not tell that it is recycled. If you want a "new" piece of wood which is not "Recycled", just convo me and we can make a custom listing for you. It may cost an extra $2.00-$5.00 depending on the size of the sign. We usually ship 14-21 business days after payment has been received. Each sign is unique, individually hand crafted for you upon purchase. If you need a sign sooner than my normal timeline, please convo me to workout the details for a Rush Order. 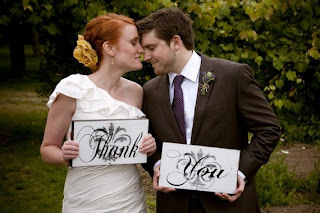 ♥ Our "Little Mini" signs will be featured in the January 2011 issue of "the knot" magazine. We will be revealing those signs soon. They are a perfect addition to any Wedding Reception, Bridal Shower, Baby Shower, Candy Buffet, Cake Table, Cupcake Table or Birhday Party....♥ We will be decorating for a Wedding in October that will be featured in Seattle Metropolitan Bride and Groom Magazine. Thank You for looking. Have a great day!!! A reminder not to wait for the perfect time!